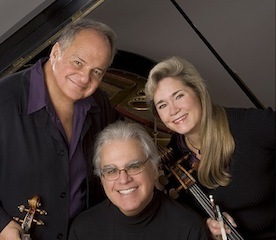 The Kalichstein-Laredo-Robinson Trio performs Stanley Silverman’s Piano Trio No. 2, “Reveille,” every year, as close to 911 as possible. They did so again Monday evening at Congregation Beth Adam in Loveland for the opening concert of Linton Music’s “Encore Linton” series. Premiered by the KLR Trio in 2011, “Reveille” is a “musical memorial” of Herman Sandler, a New York investment banker, philanthropist and friend of the Silverman family, who died September 11, 2001 on the 20th floor of the World Trade Center, having refused to leave his staff. It was the high point of the concert, which also included fine performances of Dvorak’s Quintet for Piano and Strings in A Major, Op. 81, and Beethoven’s Quintet for Piano, Woodwinds and Horn in E-flat Major, Op. 16. Joining Kalichstein, violinist Jaime Laredo and cellist Sharon Robinson were members of the Cincinnati Symphony Orchestra, violinist Timothy Lees, violist Christian Colberg, oboist Dwight Parry, clarinetist Jonathan Gunn, bassoonist William Winstead and French hornist Elizabeth Freimuth. “Reveille” (the name refers to the television and film production studio founded by Silverman’s son Benjamin, who commissioned the work) is somewhat akin to a baroque suite, with seven highly disparate movements. Intended to celebrate Sandler's life, it is in no way an elegy. This became clear shortly into it, its stylistic diversity "not intended to 'hang together' any more than life itself," in the composer’s words. This became clear at the outset, where -- following a demonstrative opening by the piano, which morphed into a gentle movement ending on a soft pizzicato chord -- it was one surprise after another. The classical and Latin music FM radio stations in New York City are close together on the dial, said Kalichstein, in opening remarks to the audience. Sandler was also fond of Latin dancing. Hence Guajira y Fuga (a guajira is a traditional Cuban vaquero, or cowboy song), a movement which blends Latin rhythms with Bachian polyphony. Robinson preceded it with a Prelude to Guajira y Fuga, an improvisatory-styled movement for solo cello in the manner of the baroque viola da gamba. The Guajira y Fuga itself opened with a big sound, Laredo and Kalichstein giving the macho melody lots of swagger before Kalichstein launched into the fugue. This became very catchy, Laredo playing with the fugal elements at length over Robinson’s rhythmic accompaniment. The Guajira which followed was extremely festive and tuneful, concluding with a big downward run by Kalichstein. The emotional heart of the piece was the Introduction and Lute Song, “Fear No More the Heat of the Sun” (based on a tribute to a dead prince in Shakespeare’s “Cymbeline”). Sung at the work’s world premiere by none other than Sting, it received a heart-rending performance by Robinson, joined later in a duet with Laredo. After an atonal, angular Postlude to Guajira y Fuga (featuring a two-note motif that spells Sandler’s name), the work concluded with a catch all finale, “Les Folies d’Al.” This is a variations movement based on Paul Simon’s “You Can Call Me Al” (appropriated because of an incident at a party where conductor Pierre Boulez mistakenly addressed Simon as Al). It had an energizing beat and incorporated jazz, big-hearted romanticism, atonality, polyphony -- a virtual kitchen sink of musical inspiration -- concluding with a reference to the upbeat dance music that follows a traditional New Orleans funeral. The audience loved it, rising to their feet at the end in an instant standing ovation. The program opened with a welcome reading of Beethoven’s early Wind Quintet. The winds, all CSO principals, gave their listeners a more “up close and personal” experience than they enjoy on the Music Hall stage every weekend. The performance was marked by pinpoint articulation and some lovely solo moments, as in the Andante cantabile, where Freimuth shone on the movement’s warm contrasting theme. Kalichstein led the way throughout, giving lively enunciation of the finale’s chipper rondo theme. The Trio were joined by Lees and Colberg in Dvorak’s Quintet, a gorgeous work which filled the temple space beautifully. Violist Colberg was a standout in the Dumka, which he invested with immense feeling, framing the movement with solemn statements of its aching main theme. The Scherzo, a furiant (a Bohemian folk dance), was a romp, the players giving lullaby-like treatment to the main theme at one point before concluding with a vengeance. There was brilliant playing by all in the Allegro finale – Kalichstein seemed positively in his element here – which brought the evening to a jubilant close.